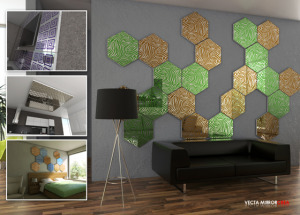 VECTA Mirror moduls are expanding the capabilities of your interior. A new series of VECTA Mirror CREA offers a wide selection of graphic performance and different colors of the mirror. VECTA Mirror & VECTA Mirror CREA are giving unrestricted access to designers to use a mirror module as a key decor in interior design. MIRROR module allows you to turn an ordinary room into an truly stylish and original. VECTA Mirror & Vecta Mirror CREA will create an unique atmosphere of the interior space, giving the additional grandeur to the interior. VECTA Mirror series have the high reflection and can be used as alternative to usual mirror. VECTA Mirror & Vecta Mirror CREA are supplied in the ready moduls in different sizes with different kind of fixation with the maximum width 125cm and maximum length 300cm.